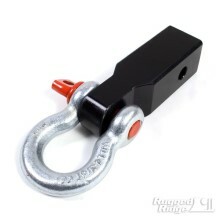 This receiver hitch D-shackle assembly from Rugged Ridge fits any 2-inch Class 3 hitch. Rated for up to 9,500 pound pulls. Not designed for towing.